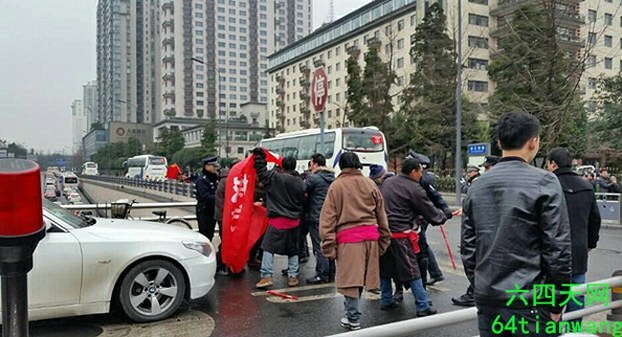 (TibetanReview.net, Feb01, 2015) – Chinese police in Chengdu, capital of Sichuan Province, had on Jan 28 detained 11 Tibetan nomads after they started protesting during a provincial legislative meeting. They were demanding the return of their land which was forcibly acquired for real estate development five years ago in Thangkor Township (Chinese: Tangke Xiang) of Dzoege (Ruo’ergai) County in Ngaba (Aba) Prefecture, said several media and other reports, including Radio Free Asia (RFA) and VOANEWS Jan 29 and 30. Carrying banners reading, “We will protect our land even at the cost of our lives” and “We have no home. Return our land,” the Tibetans staged their protest outside the Jin Jiang hotel where local delegates to the provincial legislature were staying, reported RFA and VOANEWS. However, within minutes, a force of some 50 police arrived at the scene, took the banners away, forced everyone into a vehicle, and drove them away. The RFA report said all but two of the protesters who also served as interpreters were released on Jan 30. It named the two still in detention as Jigme and Tsepak. The Tibetans had been appealing to the county authorities for the return of their land, on which they also had their homes, but without any positive result. Following the Jan 28 incident, the authorities called a meeting in Thangkor and warned its resident with unspecified consequences if they staged further protests in Chengdu.